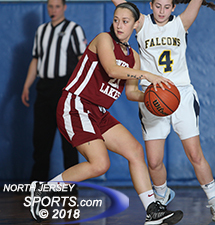 Sophomore center Emma Diamond finished with a game-high 15 points for Pompton Lakes, which got back over .500 for the season with a 51-37 win on the road at Saddle Brook on Monday afternoon. SADDLE BROOK – Even though the score was back-and-forth through the first quarter-plus of Monday afternoon’s road game at Saddle Brook, Pompton Lakes was comfortable with the way the contest was playing out. The Cardinals were content to stay in their zone defense and while Saddle Brook whirled around the perimeter at one end of the floor while also staying patient on the offensive half and making sure sophomore center Emma Diamond got her share of touches inside the paint. It was a waiting game of sorts and even when Pompton Lakes wrestled the lead away for good early in the second quarter, it stayed patient and built on its advantage one possession at a time. After falling behind by eight points at the half and a locked in a halfcourt game, Saddle Brook found it hard to cut the deficit. The Falcons got as close as five in the second half, but with few easy opportunities in transition coming their way and with foul trouble thinning its ranks late, they could get no closer as Pompton Lakes won its second straight game, 51-37, and got back over .500 for the season now at 4-3. Sophomore Alex Georgevich scored 14 points for Saddle Brook, which fell to 6-2 on the season. Pompton led 10-8 after the first quarter before Saddle Brook’s Tara Taylor scored in transition off an assist from Bianca Ianneillo 1:07 into the second quarter to give the Falcons a 12-11 advantage, which turned out to be its least lead of the game. Emily Ramirez, Pompton’s sophomore hit a 3-pointer the next time down the floor to kick off a 9-0 that turned the tide in the Cardinals’ favor for good. Every time that Saddle Brook made a run, Pompton had the answer. The Falcons drew to within 22-19 on two Ashley Georgevich free throws with 1:06 left in the first half, but Pompton scored the next four points to stretch the lead to 8 points by the half, despite playing most of it without Kayla Stygar, the senior forward who left with a leg injury and did not return. Saddle Brook was slowed by foul trouble as Ianneillo, the freshman center, picked up three in the first half and then her fourth just over one minute into the second. Taylor was tagged with her fourth foul midway through the third quarter with the Falcons trailing 32-23, but they still had run in them. 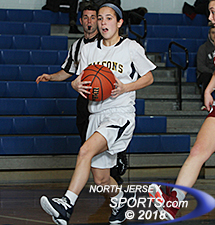 Saddle Brook scored six of the next eight points and Ashley Georgevich’s fastbreak bucket got the Falcons to within 34-29 heading into the fourth quarter. Toni Bellavia scored 7 points for Pompton Lakes, which is now on a two-game winning streak. 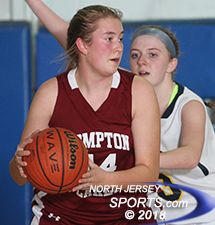 Pompton was just 7 of 14 from the line through the first three quarters, but its efficiency changed down the stretch. The Cardinals were 11 of 16 from the line in the fourth quarter and Ramirez hit 8 of 9 of her attempts in the fourth quarter and 8 of 8 in the final 4:15 of the game. Scrambling to get back into the game, Saddle Brook had three players foul out and ended the game with just two starters on the floor. The loss notwithstanding, Saddle Brook is off to a good start at 6-2. Ashley Georgevich and Asia Rivera each finished with 14 points for the Falcons and Taylor made two field goals. Lex Georgevich and Victoria McBride each made a field goal and Ianneillo had the other point for Saddle Brook, which was a combined 7 of 14 from the free throw line in the game. Diamond, the sophomore center, did most of her offensive damage in the first half as Pompton Lakes established its lead. She scored 14 of her 15 points in the first two quarters while Ramirez scored of her 13 points from the line in the fourth quarter to also reach double figures. Toni Bellavia scored 7 points, Lexi Vogt and Alexa Nardo each had 5, Cosgrove scored all three of her points in the fourth quarter and Jaida Damato made a field goal for Pompton Lakes, which will get right back after it on Tuesday against Garfield. Now back over .500 and with back-to-back wins, Pompton is poised to make a run in the NJIC and beyond. TO BUY A COLLECTOR'S PRINT OF THIS STORY PLEASE VISIT 4-FeetGrafix.com. FOR MORE PHOTOS FROM THIS GAME CLICK HERE!